LIFFEY Wanderers manager John Young was delighted to get one over on long-time foes Ballymun United 2-0 on Sunday afternoon. 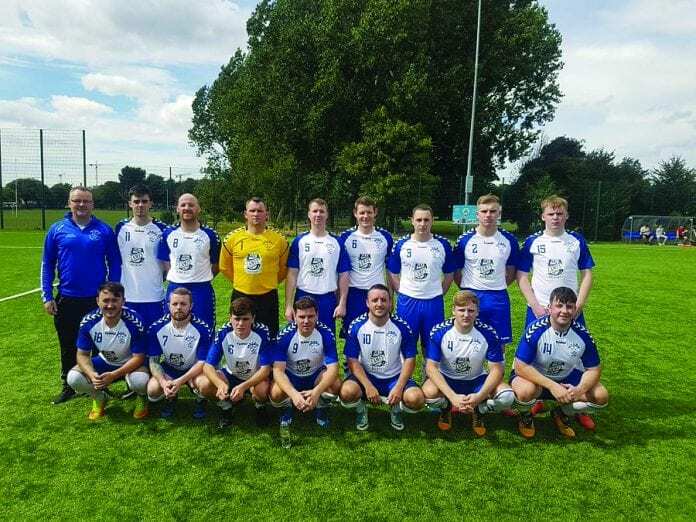 The sides have had their fair share of battles over the past couple of seasons as they sealed successive promotions from LSL Sunday Senior 1A to the top tier. Despite winning the title in both years, Liffeys had yet to get three points on Ballymun’s soil, but they took three points and the upper hand in the good-natured rivalry at the weekend. “We’ve had a great few battles over the years with Ballymun,” Liffey Wanderers manager John Young tells the Dublin Gazette. “Never any hassle with them, just great battles. It’s our first win out there – we’ve had a few draws. They’re probably slightly ahead in the battles. “We had 15 players – we’re low on bodies on the ground. We’ve a few injuries, and the captain [David Andrews] went over on his ankle in the warm-up. “We started really well and got a really good goal and, as sometimes happens, we fell back and got too deep. Cup runs and postponed games have left Liffeys with games to catch up on in the division, but Young was delighted just to get some points on the board. With no game to come at the weekend due to Wednesday’s Charlie Cahill Cup game with Glebe North, the buffer from the sides below them is even more important. “It was a really big win because we’ve played less games than a lot of teams. Games in hand are OK in the lower leagues, but not in the top league. “It’s points on the board you want, so it’s a huge win. It takes a little bit of pressure off but we’ve a long way to go. “It would be nice to think we could start looking upwards rather than downwards, but we’re not out of the relegation battle yet. “Anyone new into the senior league is always looking to consolidate, but we’d been on such a run, five promotions in a row, you’re hoping you can push on a bit. Goals at the start and end of the game from Clayton Maher and Sam Simpson were enough to see Liffeys to a this win that takes them above Ballymun into eighth. The visitors took the lead within the first 15 minutes as Lee Roche played a ball over the top to pick out Maher. The home bench appealed for offside but their claims were waved away, and the right-footed Maher struck a clean left-footed volley past the advancing keeper. Ballymun reacted positively to falling behind and Jason Kelly’s side forced Liffeys back for the remainder of the half but couldn’t find the breakthrough. The Pearse Street side put the game to bed late on when former UCD midfielder Eoin Kirwan picked played a perfectly-weighted through-ball for Simpson to finish.